Margo Souza joins four other distinguished women business leaders in writing an uplifting and encouraging book, now available direct from MooMilk.com. Most women never plan to own a business or even consider business ownership as a career option. In fact, over 30 percent started a business due to some traumatic event, such as divorce, discrimination due to pregnancy or the corporate glass ceiling, the health of a family member, or economic reasons such as a layoff. Most women business owners do not have business degrees and most were never exposed in college to business ownership as a career option. You will see when you read the book that most of these business owners didn’t start out being business owners; they became business owners by circumstance. 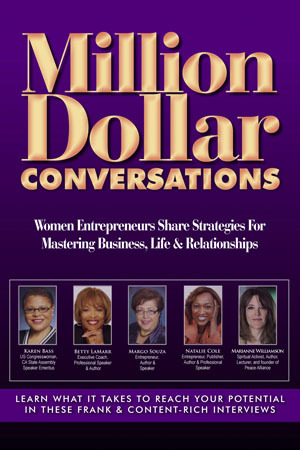 Click here to read more about Million Dollar Conversations. Get your moo on with our new line of MooMilk apparel. 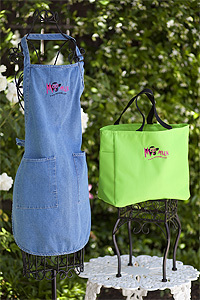 We are currently featuring custom-embroidered handbags, shirts aprons. Simply order from our online store, and we will ship directly to your door!